This amazing Ringflash can fit most lenses with a 100mm opening and most cameras with a fully adjustable "H" mounting bracket included. The glass front protects the high power flashtube rated from 3ws to 1600ws which sets in front of 12 high power white LED modeling lights. All of this is in a lightweight ABS molded enclosure with a handle that finishes with a 3 to 7 foot coiled cable. This Head works with all generations of Power Packs and can be boosted up to 1600ws. The Ringflash is a fashion icon for the cross shadow effect that it creates leaving no portion unexposed from the flash and creating interesting shadows behind the subject. While there is no wrong way to use our lighting tools, the typical way to use the Ringflash is to mount your camera into the bracket and shoot through the center of it. 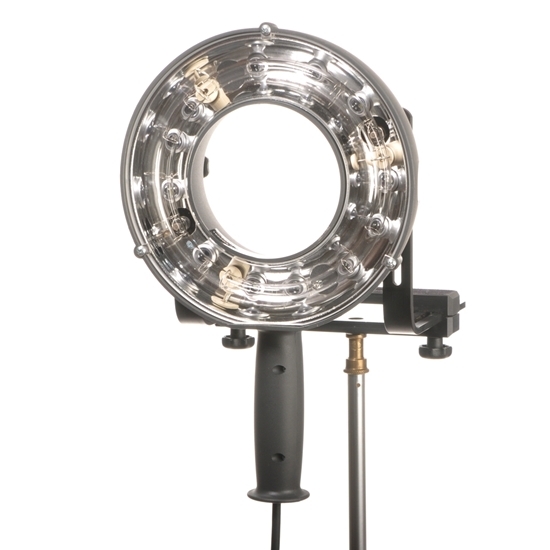 Our ringflash was the first portable one in the world with modeling lights and we elected to use 12 bright LED's for a tight but effective light to help focus and compose your shot in darker situations. Also, because many people like the "in your face" tight shots with a ring light, then the modeling lights help dilate the subject's pupils and you see more natural eye color and less chance of red eye from wide open pupils. When the flash goes off, you don't see the LED's but they come back on when the Pack is recycled. In some cases, the ringflash look seems to go in and out of style. However, Olli Seikel dedicated a stylized website to the special look he gets only with the Lumedyne Ringflash. Check out www.Ollicycle.com for several styles of example images only with the ringflash. Above the handle on the back of the Head is a button to test fire it and another to turn the 12 LED modeling lights On/Off. It has both the household and the mini-phone sync jack and a safe trigger voltage for all cameras even with a direct hot-shoe style sync cord. Because we buy the outer shells from Hensel™ and mount our own guts inside, the accessories like the Hensel™ RF90 Octa Sunhaze Soft Box will fit our Head, however we recommend that you slightly modify their speedring so you can still use our buttons and sync jacks that we added. Contact Lumedyne for more details about this if needed. The Lumedyne system is powerful enough at 400ws for most photographers and the fact that this Ringflash can easily go to 1600ws makes it amazing bright, even with an aftermarket frosted glass cover or other light modifiers.